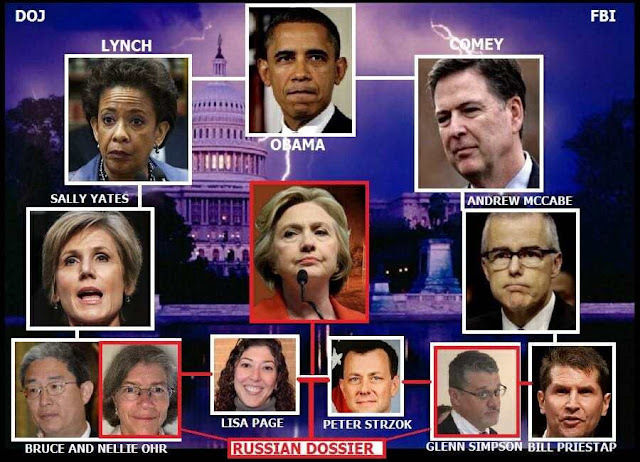 BLACK REPUBLICAN BLOG: CORRUPTION UPDATE: Did FBI Agents Create A KGB-style "Secret Society" To Destroy The Trump Presidency? CORRUPTION UPDATE: Did FBI Agents Create A KGB-style "Secret Society" To Destroy The Trump Presidency? Congressional investigators believe they are barely beginning to answer the questions raised by the text messages between the FBI's Peter Strzok and Lisa Page. 1) Strzok and Page were more prolific texters than anyone knew. In a statement late Monday, Attorney General Jeff Sessions said FBI investigators have found "over 50,000 texts" in their review of Strzok-Page communications. 2) Even with all those texts, the FBI says it cannot find the couple's messages between Dec. 14, 2016, and May 17, 2017 — a critical time in the Trump-Russia affair. It's probably safe to say there is not a single Republican on Capitol Hill who does not view this as a fishy set of circumstances and does not believe Congress should step up its investigation. 3) Strzok and Page didn't just text each other on their FBI-issued Samsung phones. At times in the text exchanges that have been released, either Strzok or Page suggested that they switch over to iMessage — suggesting they might have used personal, Apple phones to communicate about FBI business in addition to their bureau-provided phones. In a letter to the Justice Department Saturday, Sen. Ron Johnson, R-Wis., asked whether the FBI had "conducted searches of Mr. Strzok's and Ms. Page's non-FBI-issued communications devices or accounts." 4) Strzok and Page emailed each other on Gmail. Johnson's letter noted a Nov. 10, 2016, text from Page to Strzok that said: "Hey without thinking I replied to the email you sent me on Gmail. But it went to your Verizon. So please clear. Let me know if you want me to send it again somewhere else." On Oct. 4, 2015, Johnson noted, Strzok texted Page to say, "It's going to be ok at work. And haven't emailed you here, although I just did on gmail." Look for Congress to get in touch with Google in an attempt to see those emails. 5) The texts are filled with cryptic messages. Strzok and Page communicated in a sort of shorthand that was heavy on gossip and filled with references to whatever was happening in the office on any particular day. Amid that, there were many passages that might refer to the presidential race and the Trump-Russia investigation. The latest to catch Republican eyes is the "secret society" text from the day after the 2016 election. "There is a text exchange between these two FBI agents, these supposed-to-be fact-centric FBI agents saying, 'Perhaps this is the first meeting of the secret society,'" noted Rep. Trey Gowdy, R-S.C., on Fox News Monday night. But nobody knows if "secret society" represents something important to the investigation or something entirely innocent. Republicans might be on to something, or they might be mistaken. 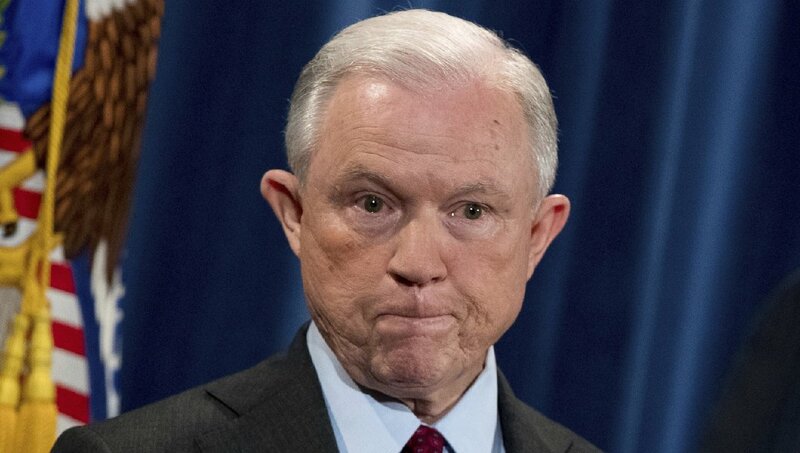 In his statement Monday, an apologetic-sounding Sessions vowed to "leave no stone unturned" in searching for the missing texts. The Justice Department will "use every technology available to determine whether the missing messages are recoverable from another source," Sessions said. "A review is already underway to ascertain what occurred and to determine if these records can be recovered in any other way. If any wrongdoing were to be found to have caused this gap, appropriate legal disciplinary action measures will be taken." A skeptical and suspicious Congress is waiting to see what Sessions finds. Will the lost texts reveal the above as members of the "Secret Society"? Late last week the Department of Justice advised Senator Ron Johnson that the FBI had failed to preserve five months’ worth of text messages between FBI counterintelligence officer Peter Strzok and FBI attorney Lisa Page. By cover letter accompanying documents submitted to Senator Johnson, the Department of Justice advised that the FBI did not preserve text messages between Ms. Page and Mr. Strzok between approximately December 14, 2016 and May 17, 2017. Keep those dates in mind. Like Virginia, the FBI is for lovers. What a disgrace to the institution and its law enforcement mission. It turns out that Stzok and Page exchanged in excess of 50,000 text messages between them, and that does not include the intense five-month period that culminated in the appointment of Special Counsel Robert Mueller to secure the removal of President Trump from office. Department of Justice Inspector General Michael Horowitz originally turned up the notorious Strzok-Page text messages in the course of his investigation of the Department of Justice/FBI handling of the Clinton email investigation in advance of the presidential election. Horowitz appears to be an honest and dogged investigator, but his mission and authority are limited. As Chairmen of the Senate’s Judiciary and Homeland Security Committees, respectively, Senators Chuck Grassley and Ron Johnson have sought to follow up on Horowitz’s work. On December 6, 2017 they wrote Horowitz to ask about his discovery of the text messages. They asked Horowitz a series of questions including one directed to the discovery of the text messages. By letter dated December 13, 2017, Horowitz responded to the questions posed by Senators Grassley and Johnson. In gathering evidence for the [Office of Inspector General’s] ongoing 2016 election review, we requested, consistent with standard practice, that the FBI produce text messages from the FBI-issued phones of certain FBI employees involved in the Clinton e-mail investigation based on search terms we provided. After finding a number of politically-oriented text messages between Page and Strzok, the OIG sought from the FBI all text messages between Strzok and Page from their FBI-issued phones through November 30, 2016, which covered the entire period of the Clinton e-mail server investigation. The FBI produced these text messages on July 20, 2017. Following our review of those text messages, the OIG expanded our request to the FBI to include all text messages between Strzok and Page through the date of the document request, which was July 28, 2017. The OIG received these additional messages on August 10, 2017. According to the Department of Justice cover letter sent to Senator Johnson last week, however, the FBI did not preserve text messages between Strzok and Page between approximately December 14, 2016 and May 17, 2017. See Senator Johnson’s letter dated January 20, 2018, to FBI Director Wray that I posted here yesterday. Horowitz’s letter, however, seems to indicate that he has in hand messages that include the period of “lost” or unpreserved messages. Whatever he has, it is crucial evidence.